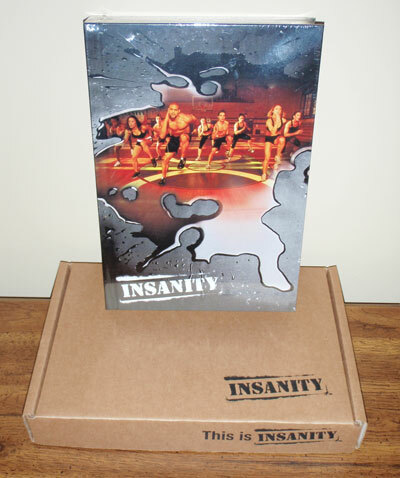 I really like the art work that Beachbody has put into the Insanity cover. Disc 1 – Dig Deeper & Fit Test – Shaun T see’s what you are made of. Disc 2 – Plyometric Cardio Circuit – Lower body plyo and cardio. Disc 3 – Cardio Power & Resistance – Strength training moves. Disc 4 – Cardio Recovery – Shaun T goes easy on you once a week. Disc 5 – Pure Cardio & Abs – This nonstop cardio workout is extreme. Disc 6 – Cardio Abs – Explosive cardio and core moves. Disc 7 – Core Cardio & Balance – Recovery week workout. Disc 8 – Max Interval Circuit – The most intense interval circuit ever. Disc 9 – Max Interval Plyo – Push your legs ’til they beg for mercy. Disc 10 – Max Cardio Conditioning & Abs – Push your cardio limits. I have a feeling that Beachbody put in the extra work to help limit the amount of frauds that can be produced. I can’t see somebody putting the time and effort into trying to copy a hard cover book like this. 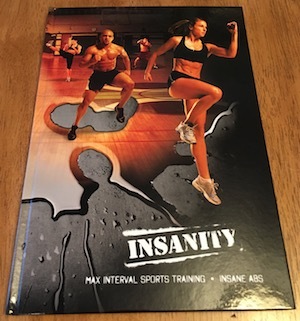 If somebody is trying to sell you Insanity Workout DVDs that do not come in a hard cover book then you’re scam alert should be going off. Nice work Beachbody. Very impressive. 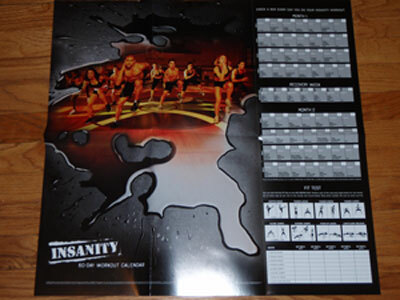 The Insanity Workout Calendar is simple and well put together. Very easy to follow. The Insanity Elite Nutrition Plan is very informative. After I read through it I think I am going to be able to give it a better shot than the P90X 3 Phase Nutrition Plan. That guide seemed to have too many ingredients. 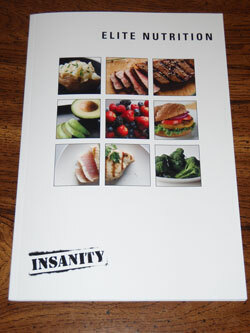 The Insanity Nutrition Plan looks easy to follow and the meal plans are similar to what I already eat. I’ll be doing the Insanity Workout Fit Test tomorrow. It looks pretty tough. I’ll let you know if I puke. I hope the Insanity workout does not kill me. Max Interval Sports Training – A very hard hour long workout. Insane Abs – Would you guess that this ab workout is insane? Upper Body – You follow Shaun T around a gym lifting weights. I did all of the deluxe workouts a couple of times but never included them into my regular routine or even used them in a hybrid plan. Shaun T talked a lot more through these workouts and they didn’t have the crisp pace of the regular Insanity workouts. I kind of forgot about them. Can’t wait to hear how the fit test goes. Let us know how it compares to the P90X fit test. The set you’re showing in the picture looks like a fake. The real ones don’t come in that little cardboard box. Its real. 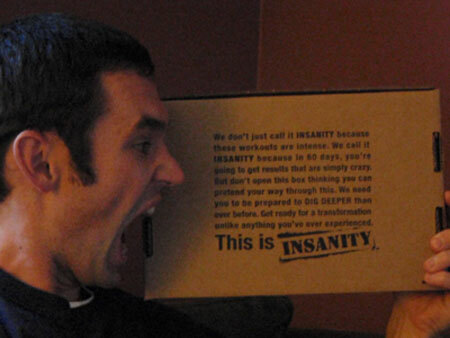 Maybe Beachbody has changed the packaging since I bought Insanity last year. Any way you can provide the calendar? I’ve lost mine and don’t remember which order to do these videos in! Do you have a Free Beachbody Account? If not, go and sign up. From there go into the Fit Tools section of the site and you can see a rundown from there. hubby and I started insanity last week. he puked. He’s not the first person to puke from doing Insanity. Stick with it. If I get the time. so people are really puking? i did p90x and i ran to the bathroom once…dry heaves…no puke. I haven’t yet but I have heard of a few who have. is there a website i can order this from?? You can buy the Insanity DVDs at the Beachbody Store. Quick question about the insanity set you are showing on your page. Did you get it from Beachbody store or from another source? I am just trying to figure if the second hand set we got is a counterfeit or the real thing. It looks exactly like your set… If it is a counterfeit we will be reporting the product we bought but we don’t want to cause troubles if it is just the older packaging..
Everything I own comes from the Beachbody Store.